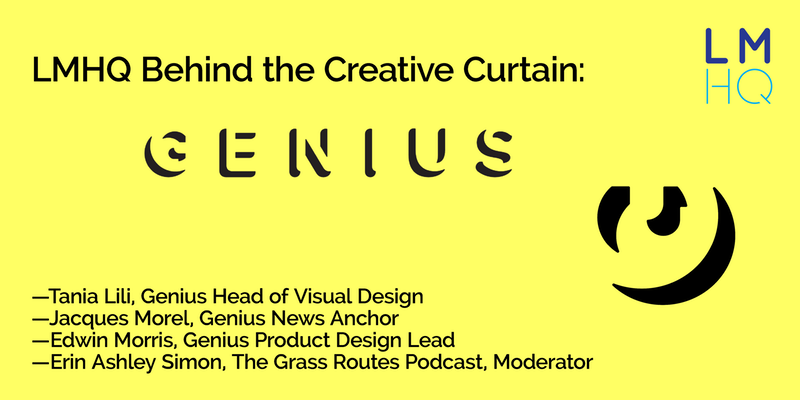 Join us for our latest installment of LMHQ’s Behind the Creative Curtain series, where big brands peel back the curtain to do a deep-dive on a core component of their business. We’re joined on May 3rd by the folks behind Genius. Founded in 2009, Genius is a unique media company that’s powered by community, an in-house creative team, and the artists themselves. They serve music knowledge to over 100 million people each month on genius.com and everywhere music fans connect across the internet. Hear from Tania Lili, Genius Head of Visual Design; Edwin Morris, Genius Product Design Lead; and Jacques Morel, Genius News Anchor, to learn all about Genius’s ethos – to give the deeper meaning behind music – and how that’s being harnessed to build their business. The Genius team will discuss how they tackle their mission from all angles: content, design & branding, and product. Our conversation will be moderated by Erin Ashley Simon, Creative Strategist and Co-Host of the Grass Routes Podcast. Doors open at 6:00 PM, and the presentation kicks off at 6:30 PM. Entrance to this free event is on a first-come, first-served basis, so please arrive on time to grab a seat. Genius started as a platform for annotating clever rap lyrics – their original name was Rap Genius. Over the years, they’ve expanded their mission to include more than hip-hop, and more than just lyrics. Every song has a story that needs to be told, and the biggest names in music—including Kendrick Lamar, Ariana Grande, and Lin-Manuel Miranda—come to Genius to give the world insight into their art. The Genius community has grown into an influential force of over 2 million contributors, editors, and musicians who sign up to discuss and deconstruct their favorite songs with fans all around the world. As a result of their collective music IQ, they have the best lyrics and knowledge database on the internet—that’s over 25 million songs, albums, artists, and annotations. The in-house creative team at Genius spotlights the stories behind the music that matter most. They work with artists and the community to transform insider knowledge into videos, events, in-depth features, breaking news coverage, and a variety of music knowledge content for the masses.